The environment can be tough on hair. Pollution from smoke and dust and other air pollutants can damage your locks, leaving them rough and prone to breakage. What city hair needs is nourishment and protection to counteract day-to-day pollution and that's exactly what Dove Environmental Defence Shampoo provides. Infused with lotus essence, this anti-pollution shampoo cleanses away everyday build-up, purifying your hair, while replenishing essential nutrients to combat damage, too. Hair isn't just thoroughly cleansed it's also deeply nourished and protected. And because the best shampoo for damaged hair shows lasting results, Dove Environmental Defence Shampoo gives you both instant and long-term nourishment as it smoothens and shields with every wash. So if you've been wondering how to stop hair fall, damage or dryness caused by pollution, here's your new first line of defence for cleaner, healthier hair no matter what lies outside. 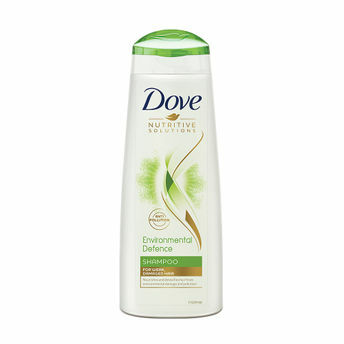 Dove Environmental Defence shampoo is designed to repair and shield hair from damage. It gently detoxifies and purifies hair, removing build-up caused by pollution. It also replenishes nutrients, nourishing and protecting strands from everyday hair damage. it is a 2-way care gives both instant and long-term results and helps even dry hair to look and feel progressively healthier. Explore the entire range of Shampoo available on Nykaa. Shop more Dove products here.You can browse through the complete world of Dove Shampoo .Alternatively, you can also find many more products from the Dove Environmental Defence Shampoo range.